Puerh Tea (tuo cha) – Fermented tea formed into cakes and producing a very dark infusion. If you’ve been exploring tea for a while you’ve undoubtedly heard a bit about puerh (aka pu-erh), or fermented tea, though you may not yet given it a try. If you consider yourself a regular tea drinker then puerh and dark teas really are a must for your tea ‘bucket list’. Originally from China, puerh and dark teas offer a very different experience. Smooth and earthy, this class of tea is produced using a very different process from other teas and offers a different taste profile which may even serve a as a great entry for coffee drinkers looking to add tea to their repertoire. Unlike white, green, black, and other varieties of tea which are oxidized and heated or fired to stop oxidation, puerh tea is truly fermented. It develops, usually in the form of compressed tea cakes over years, developing flavor and becoming smoother the longer it ages. 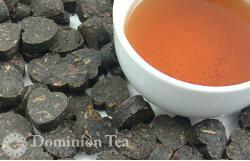 Unlike other teas, puerh is produced by partially heating tea leaves to stop most oxidation. Then they are rolled and bruised slightly before being processed into compressed forms. The compressed forms such as bricks, discs or cakes, and small birds nest shaped, called tuo cha, are then either artificially aged or left to age naturally, sometimes for decades. The development of puerh teas dates back many thousands of years to Yunnan province in China. 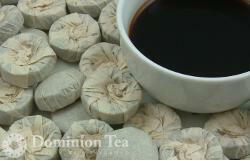 The necessity of trade led to packaging of tea in compressed discs which could be more easily transported along the tea horse road and other trade corridors. At the time tea was traded for war horses and other goods and often traveled hundreds of miles over long periods of time. During the this time, in hot and humid conditions, the tea naturally fermented and turned into dark tea by the time it reached its destination. Its often stated that the types of tea include white, yellow, green, black, oolong, and puerh tea. However, this isn’t really accurate. Puerh is actually one variety of dark tea, albeit the most famous one. In 2008, China recognized dark tea from Yunnan as being geographically protected meaning this is the only dark tea that can be called puerh despite the fact that a number of other provinces produce fermented dark teas using much the same process and tea plant varieties. Steeping your puerh tea is relatively straight forward but is slightly different than other teas. While you should steep with boiling water like a black tea, you will likely be able to steep puerh at least four to six times if not upwards of 10-15 times depending on the variety. Wake up the tea initially with enough boiling water to cover the leaf and quickly pour off the liquor. If you are steeping in a pot or mug with infuser then use 3 grams of puerh or dark tea and steep 3-4 minutes and re-steep another 2-4 times. If you are using a gaiwan, use a bit more tea, about 5 grams, and steep the first time for 2o to 25 seconds. For each additional steeping at about 5 seconds more steeping until it becomes thin. Although dark and puerh teas are unfamiliar to many western tea drinkers they can be a real treat. Unlike the other teas in your collection, if stored properly, with fresh circulating air, away from other smells and aromas, these will keep and mature for many years to come. And for those looking to make a switch from coffee, you may find both the color and flavor to be a logical first step. There is much to explore with tea, and puerh as well. This was only an introduction to the world of dark and puerh tea. In the future we will explore more to include the world of counterfeit puerh, other regions producing dark teas, and more so stay tuned. This entry was posted in Tea History, Tea Preparation, Types of Tea and tagged China, dark tea, fermented, Pu-erh tea, puerh tea, Yunnan. Bookmark the permalink.